Many methods and tools have been developed to enable the assessment of how molecular elements are changing in the cell with disease progression or other biological responses. Almost all the data, however, is simply correlative. A tremendous amount of information has been amassed and deposited into online databases about how, under certain conditions in some systems, transcription of some genes increases while that of others decreases, proteins interact or dissociate, and some genes are mutated more frequently than others. These patterns and correlations provide empirically generated genetic data that has been extremely useful to generate new hypotheses and find associations that can be used as markers for diagnosis. However, they lack the information to find new vulnerabilities in disease processes or new opportunities to influence or affect change in cellular responses. To find these exploitable susceptibilities requires knowledge of which gene products cause the changes in the biology and how they produce their effects. The challenge to developing truly novel therapies is developing an understanding of the effects on model biological systems in response to targeted gene disruption or perturbations. Experiments need to assess how the perturbation of certain genes changes the responses or characteristics of cells in a model system. In other words, data is needed that causally links genes to phenotypic changes and show which genes are regulating a specific phenotype. At present, there are only two technologies that can be used to effectively and robustly screen large numbers of genes simultaneously to reasonably assess functions in multiple model systems. With CRISPR and RNAi technology investigators in virtually any lab can run genome-wide functional screens with pooled libraries of sgRNA or shRNA. Using a few general design rules, any gene can be targeted and effectively disrupted by either of these approaches by designing a short sequence of ca. 18-27 bases in length using gene information available in numerous public databases. It just takes a few weeks to synthesize and clone into lentiviral vectors, large libraries of constructs that encode shRNA or sgRNA sequences targeting thousands of genes. These libraries can be used to introduce and stably express the effects in cells to disrupt thousands of genes simultaneously across different cells in a large population. Selection of cells with a phenotype of interest then leads to enrichment or depletion of sgRNA or shRNA targeting genes functionally regulating the phenotype. These loss-of-function screens, then, enable researchers to identify the specific genes required for general viability or other selectable phenotypes in virtually any mammalian cell system. The most commonly run perturbation screen identifies essential genes by means of transducing a population of cells with a pooled library of shRNA or sgRNA constructs. Some of the sgRNA or shRNA will make the cells they are expressed in more fit for growth under the screen conditions due to the genes they target disrupt, and so, will increase relative to the whole population. Conversely, other effectors will make the host cells less fit by knocking out genes useful for growth, and these guides or hairpins will decrease. On completion of the screen, genomic DNA from the whole population is isolated and the frequency of each integrated shRNA or sgRNA lentiviral construct in the population is assessed by next-generation sequencing (NGS). Constructs expressing shRNA or sgRNA that are lethal appear underrepresented after growth as compared to their initial representation in the pre-transduced library. This sort of “dropout viability” screen to identify essential genes is often used to look for genetic susceptibilities in cancer cells. 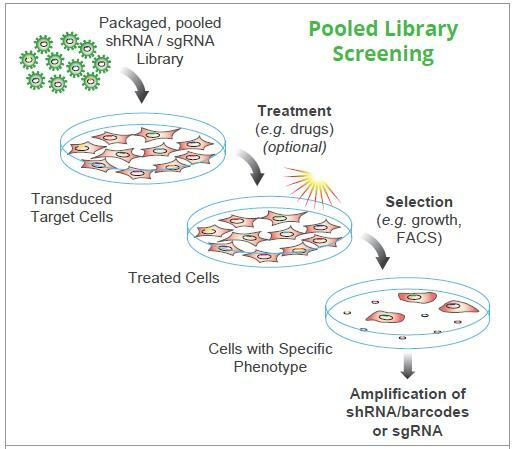 Genetic screens with pooled shRNA or sgRNA libraries can be utilized to investigate any aspect of biology that can be recapitulated in a cell culture model and provide an unbiased approach to identify genes that act to produce various biological responses that enable cell development, differentiation, and disease progression. In addition to viability, screens can be run using cell sorting or other bulk population selections. CRISPR disrupts gene function in a very different manner than RNAi. CRISPR disrupts a gene when a mistake occurs in the repair of a DNA break it introduces in the targeted gene. RNAi, on the other hand, interferes with the translation of genes by inducing rapid degradation of a gene target’s transcript. As a result, shRNA “knocks down” the expression of a gene’s protein product whereas CRISPR sgRNAs can completely “knockout” the gene. Also, CRISPR can actually be used more broadly than RNAi for genetic screen since it can be used to disrupt non-protein coding regions of the genome. Given our experience with shRNA screens, we were interested to compare how differences between the mechanism of action of the two effectors might affect the results of genetic screens. To address this, we ran test screens with both sgRNA and shRNA libraries targeting the same set of ca. 6,300 gene targets. There were 8 sgRNA or shRNA to each gene in each library. The screen was run on tumor cell lines derived from a patient with chronic myelogenous leukemia that were grafted into mice (PDX cells). For the screens, each of the cell lines was transduced with 20 million viral particles from each library so that 400 cells on average received each shRNA or sgRNA. After three days of growth, cells were selected with puromycin then growth was maintained with replating as necessary. 50 million cells were harvested for each screen. Barcode identifiers unique to each shRNA or sgRNA were amplified by PCR from the genomic DNA and sequenced at greater than 50 million reads per sample. The negative controls in both libraries—shRNA or sgRNA that do not target any genes in mammalian cells—did not show any significant changes in representation in either screen in either cell line. The positive controls—shRNA or sgRNA that target well known essential genes—displayed significant depletion in all four screens. We did note much higher variability in the shRNA positive controls relative to the sgRNA ones, especially at the later time points. Based on these observations, we analyzed the 2 week time point for the shRNA screens and the 3 week time point for the sgRNA screens. The clearest difference between two screens, was the total number of significantly depleted shRNA as compared to sgRNA. About 10% of the shRNA had significant depletion levels, as compared to only about 2% of sgRNA. Importantly, the number of genes identified by only one depleted shRNAs was much higher than the genes identified by only one sgRNAs (~35% vs 5%). This discrepancy strongly indicated that the large majority of identified shRNAs were depleted because of off-target effects. 90% of the gene targets in the CRISPR screen did not have any significant depletion of the 8 sgRNA targeting them. However, only 40% of the genes did not have any shRNA targeting them depleted. For 60% of the genes, at least 1-2 shRNA were significantly depleted. However, when we looked at genes identified by 4 or more depleted shRNAs or sgRNAs, the results of two screens were more similar. The overlap between the top genes identified as essential in each screen was close to 50% in duplicate screens. Further, many of the genes that were only found in one or the other screen with the first pass stringent analysis could be identified in the complementary screen with slightly relaxed statistical criteria. Thus, the concordance between the two approaches was very high. In order to answer the question whether CRISPR or shRNA exclusively identifies certain genes, we looked to see if any targets identified in both cell lines using one technology were statistically indistinguishable from the baseline in the complementary screen. We observed that a set of genes (ATP6V0B, DHFR, ERCC2, FARSA, NARFL, PGAM1, SCYL1, TRMT112) were identified by the CRISPR screen that showed no discernible signal in the shRNA screen. On the contrary only one target, ubiquitin C (UBC), was found in the shRNA screens showed no signal in the sgRNA screen. For the genes found only in the CRISPR screens, most likely, small levels of their products are sufficient for cell viability while complete elimination of them is lethal. The shRNA-only ubiquitin (UBC) gene, on the other hand, is expressed in multiple tandem copies and has a paralog UBB. Thus, it may be difficult to disrupt production of all forms of the transcript with a single targeted sgRNA. Given the significant overlap, it is clear both RNAi and CRISPR libraries are reliable tools to screen for essential genes. However, there are some differences that can turn up using the different approaches. From the study, it does seem clear that screens with shRNA libraries are substantially noisy due to the high number of off-target effects. This is something that needs to be considered and, in general, it is critical to ensure there are enough shRNA to each gene target in a library to be able to filter out this noise. The 8 shRNA per target used in this screen seem to be near the minimum number one would want. On the other hand, the sgRNA screen is much cleaner, and so, fewer sgRNA per target gene should give similarly reliable results. It is also important to note that this was just a single dropout viability screen. As noted above, there are many types of screens that can be done with these sorts of libraries, in particular FACS-based screens or positive selection where toxic factors are added to the cells to induce a necrotic or apoptotic response. With other sorts of selection, there may be more differences in the results that occur between screens with shRNA versus sgRNA libraries. To this point, the Bassik lab at Stanford (Nature Chemical Biology, 2016) has noted several differences between shRNA and CRISPR results when running positive selection screens with cytotoxic compounds. For more details on how RNAi genetic screening with pooled shRNA libraries works, please see the Pooled Lentiviral shRNA Library User Manual. Also, please review Cellecta’s CRISPR and RNAi Genetic Screening Services. For CRISPR screening, you may see the CRISPR sgRNA Library User Manual and see the CRISPR and RNAi Screening Services web page. For additional information on Cellecta Genetic Screening services, please contact us.